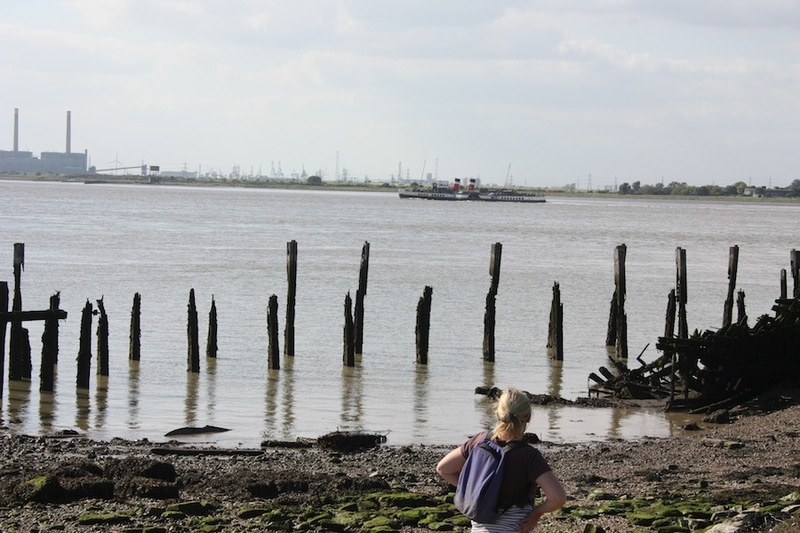 One of the largest of UK estuaries, The Thames Estuary is also one of the busiest shipping routes, and yet there are many little-known places along the river. As part of Estuary 2016, we asked writers and artists to share their favourite walks. Highlights: 13th century church of St. Helens, Cliffe Pools RSPB reserve, largest avocet colony in the UK, extensive river and marsh views, estuary skies and marsh harriers. There are so many fabulous walks on the Hoo Peninsula, that wonderful spur of land that juts into both the Thames and Medway estuaries from the north Kent coast, that it’s hard to narrow it down to just one. But for a compact walk that takes in culture, nature and history on this largely unsung, beautiful and evocative peninsula, I would recommend the Cliffe Pools route that follows the seawall towards the Thames. You begin at the immaculate 13th century ragstone and knapped flint church of St. Helen’s in Cliffe, the village sitting atop an escarpment that commands dramatic views over the marshes of the Thames Estuary. And in the northwest corner of that graveyard stands a restored charnel house, one of only a few still to be found and kept in use until the early 20th century for victims of drowning, a poignant reminder of how many souls the great river took as it fuelled the growth of the imperial city. "Although I’ve beaten the bounds of the Thames Estuary and in particular the Hoo Peninsula for many years, perhaps most notably in the company of Iain Sinclair when we dragged a swan shaped pedalo across the Isle of Sheppey, it would be very hard to choose a ‘Favourite Estuary Walk’. "I would however suggest driving to the Isle of Grain, parking up at St James’ Church and walking directly towards the River Thames, making a right, walking half a mile and then looking out-to-sea. There stands Grain Tower, a former artillery stronghold constructed in the 1860s to defend the confluence of the Rivers Medway and Thames during a period of tension with France. 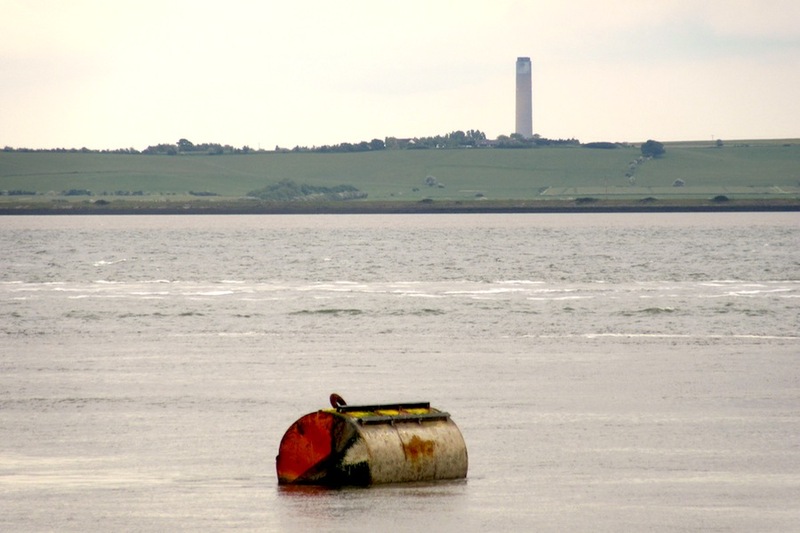 Remnants of the tower are still visible and I would recommend walking along the jetty at low tide, climbing up the metal ladder and spending a whole tidal cycle on board." I love this walk as it is wild and remote and you can see some wonderful birds and even seals whilst walking along the coastal path of Higham Creek. I find it excellent for beach-combing and for collecting washed up items which I use in my artwork. It is not particularly long, but the time spent collecting driftwood and looking at other exciting washed up objects makes up for that. All in all it is probably just 2.5 miles there and back. Thousands of south Essex people look across the Estuary to St Mary's Marsh every day, yet how many have actually set foot there? 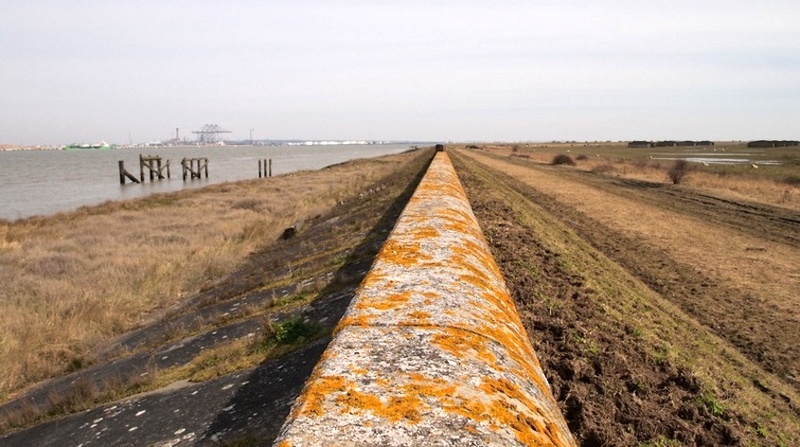 It is certainly worth the journey across the Thurrock Bridge to walk the Kent shoreline and to explore this huge, remote, green place, the wildest stretch of countryside on the Thames Estuary. There is also the boon of seeing Southend, Leigh and Canvey as you may never have viewed them before, as distant, slightly mysterious presences across the water. St Mary's Marsh is Charles Dicken's country, the setting for arguably his greatest novel, Great Expectations. But watch your step. I once fell into a drainage ditch on St Mary's Marsh, while I had my nose stuck in a copy of the book. Read more.